Developing good study habits mean you use your time well. Time, of course, is the most valuable resource we have; but it's unbelievably easy to waste. 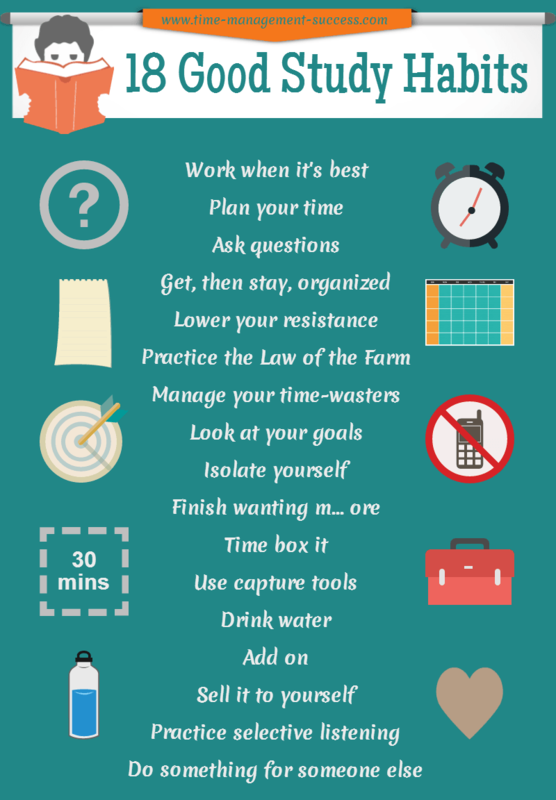 Improving your time management means you can decrease the time it takes to do your work but still increase the quality of what you produce. In other words, less can produce more. Before we go any further, remember that this is about developing good habits, not skills. Skills make you better at studying; effective habits make you better for studying. When do you work best? Are you an early bird, night owl, or something in between? Find your rhythm, then plan to study at your most productive time. The next day, week, term or semester. Whatever time frames you use, time you invest to plan will pay for itself many times over. Speculate to accumulate. Of all the good study habits you can develop, this one is key. Just ask. If you don’t tend to do this, remember: success is defined by the number of uncomfortable conversations you’re willing to have. Arrange your space, stuff, time and technology so they help, rather than hurt you. Once you learn how to get organized, make sure you stay that way. One of the biggest time wasting ‘enemies’ you face? You! Part of you knows you should study, but another part of you wants to have some fun now. Using this Quick Win method daily can make all the difference. Stephen Covey suggested that it’s better to study in the right season of time rather than cramming it all in at the last minute. A farmer can’t cram with crops. It has to be done in it’s season. 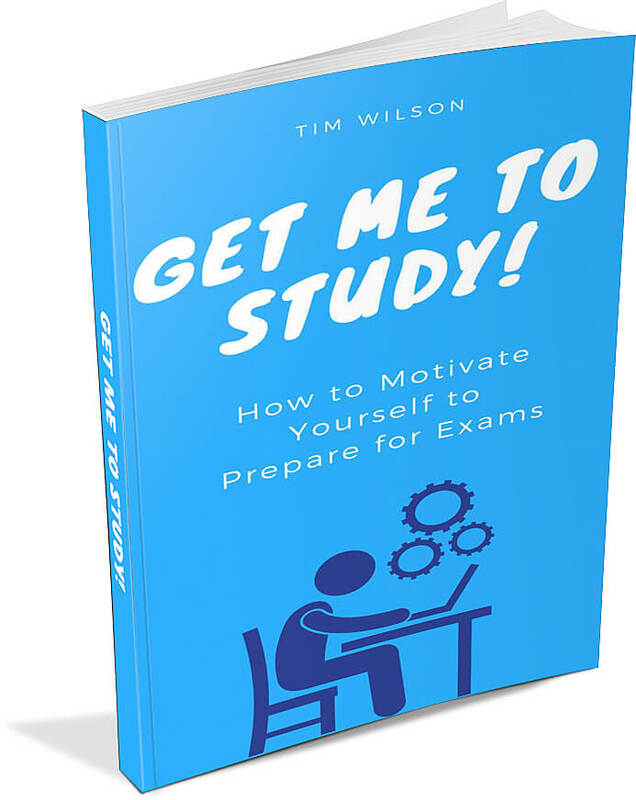 Cramming may or may not get the grades, but it won’t get you an education. Wasting time online often leaves you feeling bad afterwards. Software such as rescuetime﻿ is good for managing it, but the worst thing to do to stop is to try and stop it completely. Give yourself permission to waste time within limits. One simple but highly effective habit is to constantly remind yourself what you’re studying for. Your dream grade, posted on the wall next to your bed or computer means you’ll see and think about it daily. In fact, of all the tips on setting goals, this one's a 'must do'. Each day, break off a bit of your hardest task. First thing is often the best time to do this. It limits the effect of the task on your mind if you do it early. You also get to feel good all day because it's done. Turn your communications off when you study. Even better, put them out of site. If your phone rings or an email announces itself, what happens? Many people struggle with managing interruptions like these, and work grinds to a halt. Give a task a block or 'box' of time to get it started. It needs to be short enough not to put you off, even if it’s a few minutes. Often, the thought of starting is the problem. But once you do, it’s easier to keep going. Enough time boxed sessions will mean you finish it. Learn how to avoid procrastination by time boxing. Capture thoughts, ideas and concepts before they vanish into the ether. Good study habits depend on time management tools that are simple to use, easy to access and consistently work as a way to capture information that would otherwise be lost. The key word there? ‘Use’. Stay topped up with enough to concentrate fully. Keep a bottle nearby, because good study habits depend on hydration. Tack on a pre-study task to prepare yourself. The more your senses engage with this, the more effective it is. This is especially true with the sense of smell. A certain odour (preferably pleasant!) can become a powerful anchor for developing good study habits. Thoughts become things or, to put it another way, we do what we think about. The see-your-goal example above is a simple way to start the process of marketing to yourself. Visual images, such as posters, have an impact, as does your language. If you’ve ‘got‘ to work, it’s less than appealing than if you ‘decide’ to. Listening is tough. When you do listen, do so really well. Identify the 20% of what's said that matters, and take it in. Use whatever capture tool you like -- just do it. Help someone else, and you reinforced your own understanding. Ideally this will be with another student, but it doesn’t have to be. You could even explain it to yourself in the mirror. The vast majority of what we do is habitual. Developing good study habits is a process you learn. Some study skills and habits are easy to implement, others less so. Whatever your experience, give these a go -- you’ll be a better student for it. They will appear on a web page exactly the way you enter it here. You can wrap a word in square brackets to make it appear bold. For example [my study habits] would show as my study habits on the Web page containing your words.